Here’s an index of the previous “locker” posts. Let’s start with a photo from a secret salt seeking an identification. 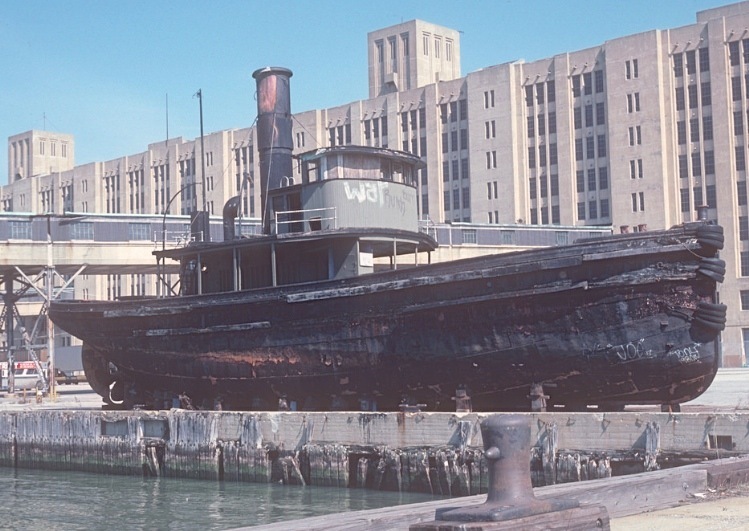 All I know is that this photo of an “old army tug” was taken in 1982 and that the building in the background is the Brooklyn Army Terminal, a frequent background in sixth boro photos even today. Anyone supply an identification of the vessel? Here’s a photo I took about two weeks ago . . . sand that looks almost like sawdust. The nearer scow is marked Lexa Gellatly. My question is . . . is that the same hull but transformed as this one, once used to transport oil? Do oil barges sometimes get transformed into scows? And where is this sand coming from/going to? The next photo comes from Justin Zizes and an event I missed last week because I got triple-booked; what’s happening is the unveiling ceremony for the USS Monitor Trail Marker to commemorate the 150th anniversary of the end of the US Civil War. 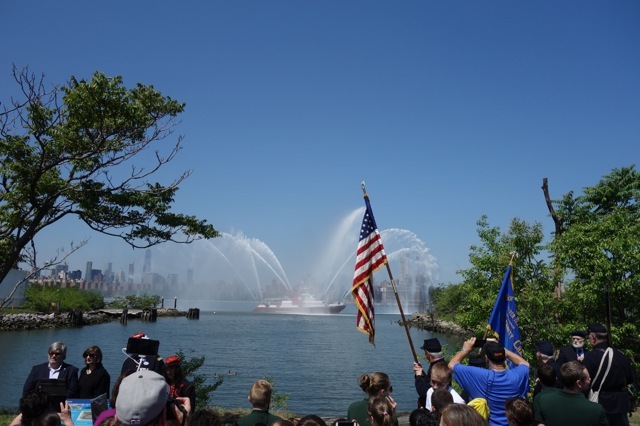 FDNY’s 343 adds solemnity to the event. The water here, Bushwick Inlet, once received new builds from the slipways of Continental Iron Works. Next . . . a number of you have written this week about the fabulous new photo archives assembled by the New York Public Library. I’ve already spent lots of hours meandering there. What makes the archive so remarkable is the interface: you click on dots on a street map of NYC, and each dot reveals archival photos of that site. 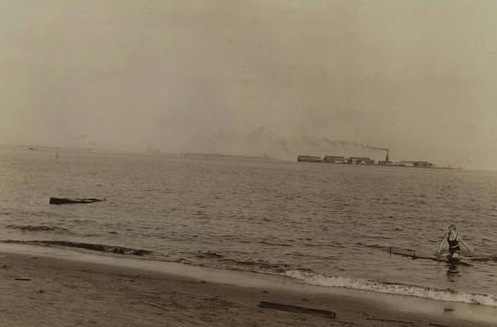 Let me share a few here: as seen from South Beach Staten Island, Hoffman Island in the distance as it existed in 1925. I’d love to see post-WW2 but pre demolition of the island buildings. 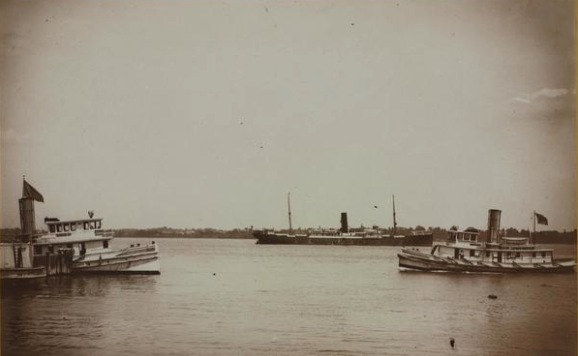 Hoffman Island closer up with SS Perugia in quarantine. I won’t guarantee the veracity of the captions on all the photos. After all, GIGO. 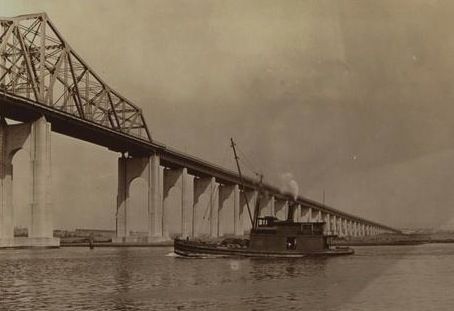 1935 “stick lighter” approaching the Goethals Bridge. There are literally thousands of photos in the archive. Have fun. I’d love to hear from you with any news. I’m currently gallivanting and will be back–I hope–by the end of the week. The first picture is AQUA , x NEW YORK CENTRAL No.29. 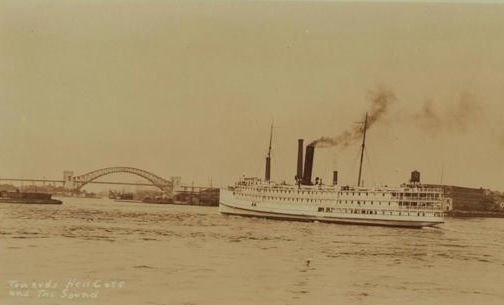 Built Port Richmond ,S I in 1912. reportedly scrapped in the location of the photo in the autumn of 1984.
jeff–thx. did AQUA really have a wooden hull, as it appears in the photo? The AQUA was riveted and was formerly a part of South Street Seaport Museum. 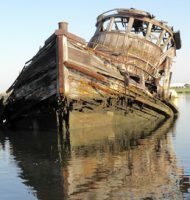 She was a water boat, delivering potable water to ship and worked into the early 70s. She had a very tall one0cylinder steam engine in her that SSSM removed with the plan of activation the thing with street steam. great idea but never came to fruition. A bunch of people tried to help tSSSM with solutions to save her but Witte eventually junked her on the spot where the photo was taken. She was a lovely boat. Another hit for the harbor. The engine was removed in Nov. 1977 after I and volunteer Jack Witkowski dismantled it in the vessel. The 14 ton engine is of interest as it has characteristics akin to a stationary and not a marine plant. As Pamela indicates, the plan was to set up the engine as an active exhibit or re-install it into the vessel – after 38 years, nothing came of either idea. The engine is currently in the car float, Hughes 925, at Caddell Drydock and Repair. There may be some possibility of saving the engine through a private savior. was the HUGHES 925 the carfloat that used to be at SSSP?